A week after the Sudanese President Omar al-Bashir’s decision to impose a year-long state of emergency in an attempt to end the protests, Sudanese protesters appear to be settling in for the long haul, urging professional associations, opposition parties and average citizens to continue taking to the streets until the regime falls. On Thursday, in the latest move to placate the protesters, it was announced that Bashir's newly appointed deputy, Ahmed Harun, would take over leadership of the ruling party. According to National Congress Party rules, this means that he, not Bashir, would be the party's presidential candidate in 2020, although it is too early to know exactly what this new maneouvre signifies. Al-Bashir's earlier speech left Sudanese - at home and in the diaspora - disappointed after daring to hope he would do the right thing and resign, making way for a transitional government and a new era for Sudan. Instead, Bashir merely asked parliament to postpone the proposed constitutional reforms that could see him run again in 2020 presidential elections. The speech can be likened to what the Sudanese call mjamala, the utterance of platitudes at a formal event, such as a funeral or a wedding - or, in this case, a people’s uprising, where people have been killed at the hands of state operators. Opposition parties have criticised Bashir’s recent moves as an attempt to buy time, arguing that a ministerial reshuffle is not enough to address people’s fundamental loss of faith in the regime’s capabilities to govern and meet their needs. The declaration of the state of emergency is merely a pretext to strengthen the state’s attempts to curtail legitimate protests. Interestingly, Ali al-Haj, leader of the Islamist Popular Congress Party, praised the speech, which is a clear indication of the resilience of political Islam. As one link in its political structure fractures, namely the ruling National Congress Party, another comes to the forefront. Sudanese activists and protesters responded to the president’s speech and Thursday's announcement, with disappointment, derision and defiance. 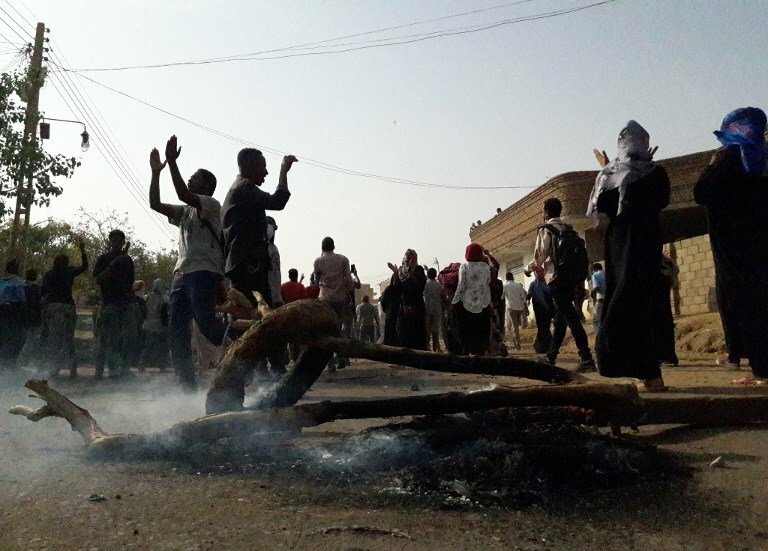 Sudanese social media commentators have warned those on the ground not to be fooled by what they describe as the president’s cynical attempts to derail the uprising’s momentum. For the past three decades, the Sudanese state has largely addressed its citizens as protagonists in a heroic tale, where obeying God and the rulers of the land leads to success in this life and the next. Bashir is deaf to the calls from the Sudanese people to step down, viewing himself in messianic terms as the father of the people. But the Sudanese people are not children; they are self-consciously casting themselves in this unfolding drama as disciplined revolutionaries, committed to the democratic transformation of their country from within. It is important to note that the key factor that has set this uprising in motion is the national consensus and the solidarity of the Sudanese Professional Association, a body uniting doctors, lawyers, teachers and engineers under its umbrella. The opposition political parties arrived late to the scene by showing support for civil society forces. The adage that “people get the government they deserve” is certainly not true in Sudan. Bashir’s government came to power in a military coup, supplanting a democratically elected government. After his 30-year dictatorship, Sudan’s political scene has been greatly weakened. The political parties in waiting must summon the vision to rise to the opportunity that may come soon. This is specially true for the Sudanese communist party that needs to reinvent itself with a socialist, secular political agenda that is relevant and meaningful to contemporary Sudanese realities. Other political parties that sprung up as political wings of armed groups, including the Justice and Equality Movement and the Sudan People’s Liberation Movement-North, must address the place and role of their armed factions within a civil government. The sectarian political groupings, such as Umma, need to clarify the role of political Islam and dynastic politics in their political manifestos. Some Sudanese commentators believe that the revolution has already been realised - that through new appointments and the postponement of constitutional reforms, Bashir has already made a tacit handover to the military. The next step, according to this scenario, would be his departure on an extended sick leave abroad and the establishment of a de facto transitional government. Others, however, say that Bashir is engaged in Machiavellian manoeuvring to join forces with the army against his own party, which is seeking to oust him. A third perspective is that the regime has run its course, but Bashir cannot resign - even if he wants to - until certain geopolitical conditions have been met. Maintaining the legality and legitimacy of the regime, even as it is dismantled, is important for global interests. If successful, the uprising will bypass the 2020 elections, while also calling into question the legality of the regime, its debts, and the agreements it has signed in the name of the Sudanese people. The youth on the ground in Khartoum and other major cities have spoken out against the growing gap between their country’s rich and poor. The party, that came to power in 1989 and adopted the slogan "to eat what we grow and wear what we make", has produced a super-rich class that has profited from its proximity to power. Had Bashir in his 22 February address made a sincere and concrete pledge to address the economic question, and in particular the corruption that has brought the country to its knees, he may have redeemed himself to the Sudanese people. Meanwhile, on social media, a potentially apocryphal tale is circulating, according to which Bashir once asked any state employee with evidence of economic corruption to bring it to him for action. A young police officer submitted a file to the anti-corruption committee that the president had formed, and as a reward for his honesty, he was sacked from his job and imprisoned for four years before fleeing to Sweden, the story goes. The Sudanese people have trusted and tolerated Bashir and his Islamist party’s stewardship for a long time. But the tide has now turned, and people are ready for change. The honourable thing would be for Bashir to facilitate a proper handover and leave. But where would he go? Bashir is, after all, wanted by the ICC. The presidential office protects him and those implicated alongside him over human rights violations in Darfur. Going forward, the military will play a pivotal role. Bashir, himself a military man, has connections and support within the national army. But the people are calling on the army to be on the right side of history, reminding them that they swore an oath to defend their country and their fellow citizens, rather than to guard the interests of any single political party or ideology. The possibility for a peaceful transition, therefore, is in the hands of Sudan’s military. *Taghreed Elsanhouri is an independent British-Sudanese scholar and filmmaker. She began her career in broadcast news and entertainment television, working for MBC. She directed several documentaries like "Our beloved Sudan" and the "Orphans of Mygoma". Her directorial debut "All about Darfur" won the Award of Commendation from the American Anthropological Association in 2006 and the Chair Person’s prize at the Zanzibar International Film Festival (Ziff) 2005.